There are no sure-fire ways to remove a ring that's stuck on a finger other than cutting the finger off, which is typically not an optimal choice. The method below is easy and does not require medical training or special equipment. Methods that involve wrapping the finger or using specialized equipment should be attempted only by trained medical personnel. In cases of injured fingers, seek medical help immediately. Don't spend time trying to remove a ring from an injured finger. The binding of a ring around the finger may act as a tourniquet, trapping blood distal to the wrapping and potentially causing permanent damage to the finger if not removed promptly. Do not attempt ring removal if the finger is swollen, blue or purple, or if there is no feeling in the finger. In case of injury or if the finger appears to be swollen and discolored, go to the urgent care or emergency department. Unless you have absolutely no other option for transportation, calling 911 for an ambulance is not necessary. Common sense can prevail here. If there is no injury to the finger, try removing the stuck ring at home before going to the emergency department or to the urgent care center. This process uses a version of RICE, which is the first aid option many choose for treatment of sprains and strains (even though some people, including me, think that there could be a better option). RICE stands for Rest, Ice, Compression, and Elevation. It's the ice that makes some folks uneasy about this treatment option. Despite the fact that some folks don't think ice is a great idea for sprains, it remains the absolute best way to remove a ring that's stuck on a finger. If, that is, you plan to keep the finger. Elevate the affected hand high above the heart. Keeping the hand high will help blood drain from the tissues and bring down any swelling. Don't put the hand down for the entire procedure, or else you lose the benefit of elevation. Keep the hand elevated until the ring is removed. Cool the finger with an ice pack for 20 minutes or with direct ice for 10 minutes. An easy way to cool the finger is to dip it in ice and water. Remember to keep the hand elevated while cooling the finger. Just grab a cup of ice water with your ring finger in the water and hold the whole thing over your head. You can even rest it on your noggin. That's a great motivator not to let it spill. Once the finger is cold and has been elevated for at least 15 to 20 minutes, use a lubricant to make the finger slippery. Baby oil, coconut oil, butter, vegetable oils, or mineral oils work well. Soap can sometimes irritate the skin and may dry it out, but it works in a pinch. Compress the finger in front of the ring before trying to move the ring. Just use your other hand and squeeze the finger. Your other hand is going to warm up the finger, so it's not a bad idea to cool that hand down as well. Work the ring slowly over the iced, compressed, oiled finger; moving too fast will result in more swelling. Remember: Keep the affected hand elevated throughout the procedure. It may be necessary to cool the finger with ice multiple times during this process. If direct ice or iced water is used, remember not to expose the finger for more than 10 minutes. If an ice pack is used, expose it no more than 20 minutes. Always keep ice off the finger for at least five minutes before cooling again.​ Just keep working the ring off of the finger for the whole five minutes. If the finger is swollen in front of the ring or seems to bunch up as you work the ring off, then apply ice, compression, and oil again. Keep working slowly. 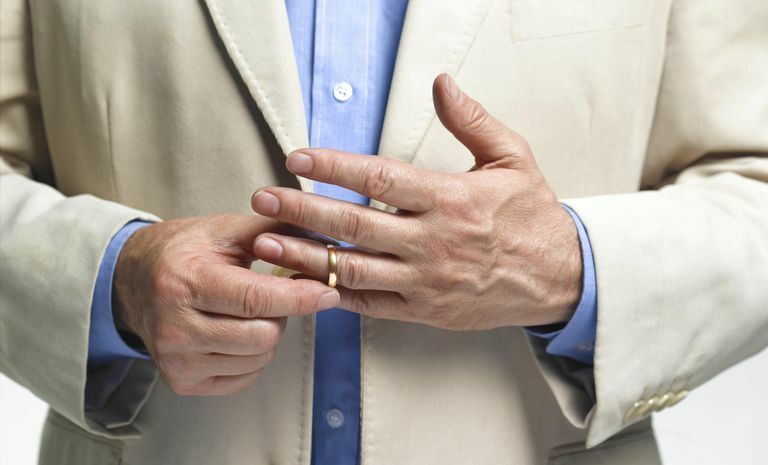 If the finger becomes swollen and discolored, or if several attempts to move the ring do not work, you can seek medical attention. Don't be in too much of a hurry to go to the doctor if the finger is in good shape. Progress may be very slow. Be patient and keep working at it. If you do need help right away, fire departments, hospital emergency departments, and many ambulances are equipped with cutters to remove stuck rings. Kumar A, Edwards H, Lidder S, Mestha P. Dangers of neglect: partially embedded ring upon a finger. BMJ Case Rep. 2013 May 9;2013. pii: bcr2013009501. doi: 10.1136/bcr-2013-009501.